August 22, 2018 (Last Updated: April 9, 2019) - As an Amazon Associate I earn from qualifying purchases. Quintessential comfort food right here in this All American Apple Pie recipe. We through in a decadent caramel sauce to just make it that much better. What a beautiful dessert and you can make it today. America and Apple Pie go hand in hand. Today we are going to do the best we can at making the best dang American Apple Pie. 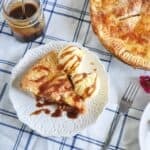 In addition, we are going to work on a butter pie crust and to top our recipe off, we are going to share a simple caramel sauce that is absolutely divine. This pie is our perfect apple pie in the apple pie series. 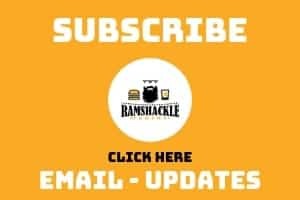 We are also in the middle of a fantastic Back To School FOR ADULTS giveaway, so make sure to sign up for that! Overall, we are going to be giving you some great flavors and the best dang American Apple Pie there is! Alright, folks, greatness has a price and in this American Apple Pie recipe, the price is the butter pie crust. If done well, this is an excellent crust, but pie crusts can be finicky. Sure, you can go out and purchase a premade pie crust from the store and it will be just fine. If you love making things yourself, however, this is a great recipe for you. Everything else about this recipe is very simple. 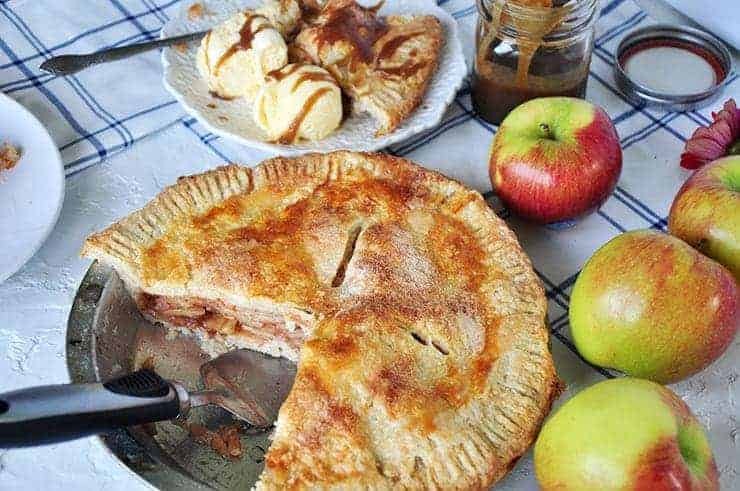 The filling, which really is the star of the American Apple Pie is so easy and if you can get the butter crust down for this American Apple Pie, you are going to be paid dividends in flavor for all of your future pies. To be clear, I have probably made less than five pie crusts in my life before starting to research the apple pie series. Since I started this series, I have made what feels like a bajillion of them. I felt it very important to get the crust down, as while the crust is not the star of the apple pie, it does separate mediocre pies from freaking fantastic pies. I decided that butter was the best option for my pie crust. A very important element to any flaky pie crust is a fat. 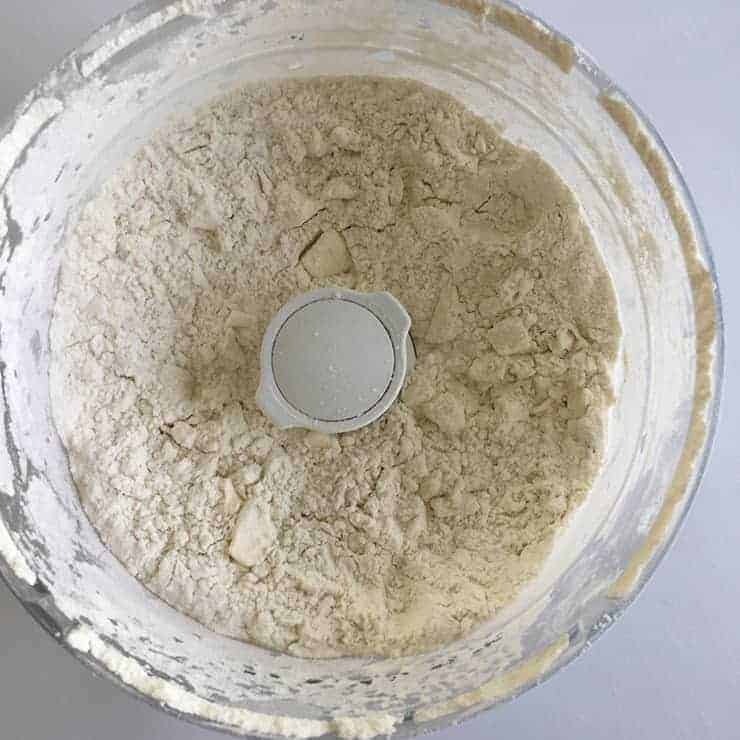 Other ingredients that people use are shortening, oil, and lard. Some others use a combination of shortening, lard, and butter. If the fat is incorporated appropriately, it will be in chunks that are large enough to evaporate. The evaporation will create pockets of air that create a flaky crust, which is most often ideal for fruit pies. The trick comes in making the fat mix in with the dough in such a way that there is enough to evaporate in a good way. Butter is one of the more difficult fats to work with in this regard, but we are going to reach for pie greatness. 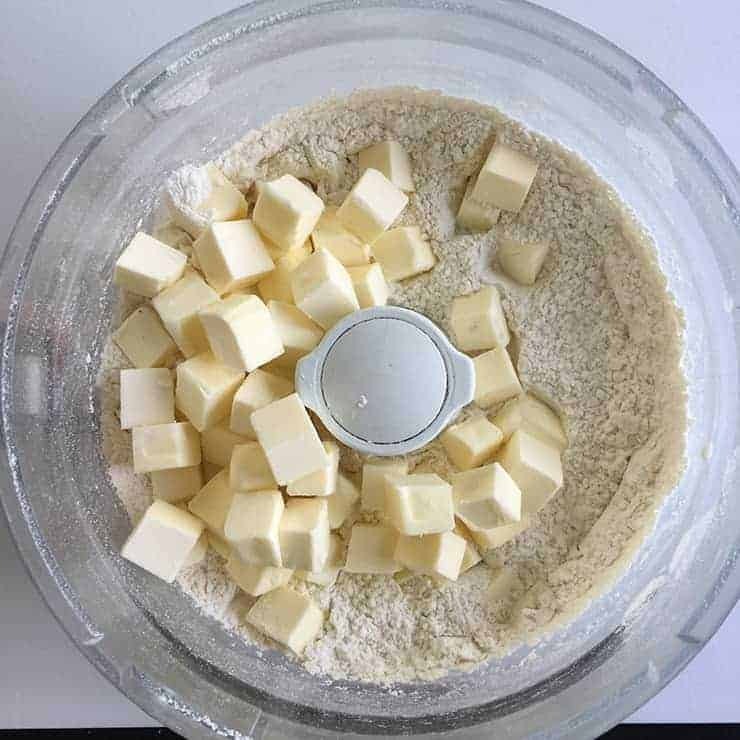 The ingredients in this butter pie crust are very important, but there is more to this great pie crust than just the ingredients or instructions. I have found that I need to find my zen place when I go into the task of making a perfect butter pie crust. Baking has not been my strong suit, but we want to make a perfect apple pie and so I had to find that place. Working with butter in pie crust can be challenging, but if you go into it with the right combination of knowledge and patience, you will be fine. Temps of the oven when we bake is important, but the temperature of the butter before the oven is probably most critical part of making a flaky pie. The end game of our crust is that when we have it rolled out, we will see larger spots of easily identifiable butter in the crust. While we are handling the butter, we want it to be so cold that it can take the manipulation that we need to do to roll out. We need our butter COLD! So, we cut sticks of butter into ½ inch cubes and then throw them in the freezer. Even cutting the sticks of refrigerated butter gives it more heat than we want. When we start blending the flour in there, we want some nice, cold, hard (but not completely frozen) butter. After we have mixed in the butter, we then form it into two discs where the temperature becomes very important again. We place our dough into the freezer for another little bit to both make the butter and the dough (as a whole) hard enough to give us the butter-spotted look that we are searching for. Finally, we have the temperature of the water. We want our water as cold as possible, as we don’t want this to contribute to breaking down our butter. I fill a bowl with ice and add water to it. Any water I use comes from that bowl. Temperature is vital in this American Apple Pie butter crust. There are a few different places where balance is very important in making a great butter pie crust. First, it is the butter. We spend time cooling our butter before we mix it into the flour. When we do start mixing our butter in, we want the butter to spread, but we don’t want the butter to disappear. We need to find the balance. When I pulse my food processor, I only give it between five and 10 finger presses. I don’t want my little chunks of butter to be any smaller than peas (erroring on the size of larger). I still want to be able to easily recognize the butter in my crust, but I want a little bit of incorporation into the flour mixture. There is the water balance, as well. 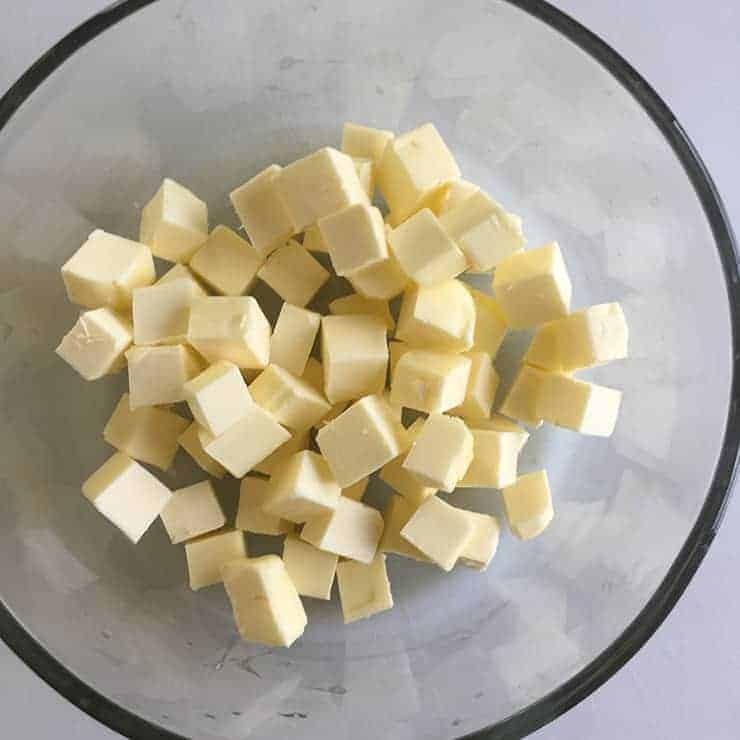 After we have mixed the butter in, I move it to a large bowl. I am going to add some ice cold water to the mixture, but it needs to be the right balance. I want to be able to reach down, grab some dough, and squeeze. If the dough sticks together and it feels like I might be able to take a rolling pin to it, I win. This is, however, a balancing act. I want my crust to be just on the edge of where I can roll it out. If I add too much water, it may be easier to roll out, but it might make for a tough, non-flakey crust. 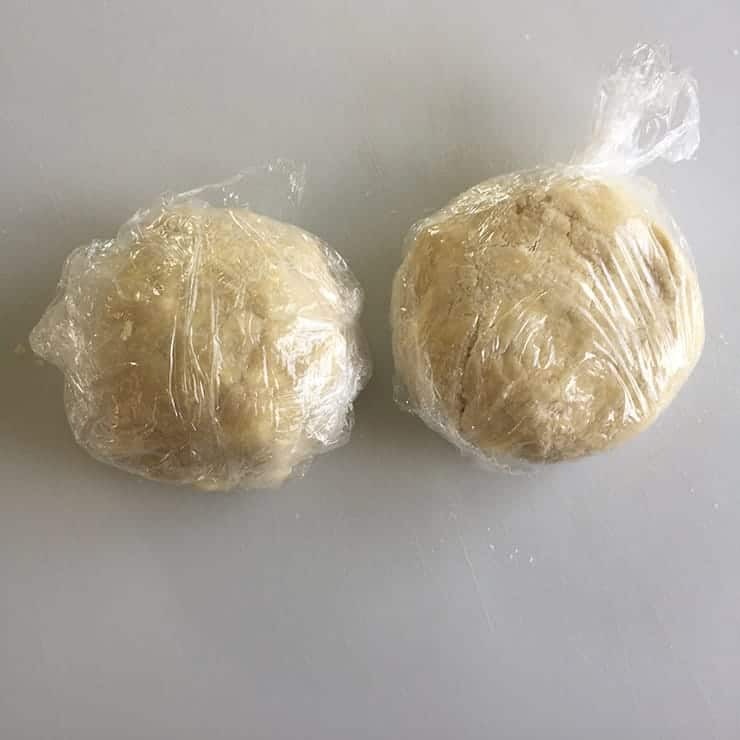 If I add to little water, rolling out the pie dough becomes impossible. This is why we slowly add water and test as we go. Also, there is just no ONE answer for how much water is needed. About one-half cup is where I would give the middle ground, but you really have to use your squeeze to get it right. We are in the middle of a balancing act that needs perfection. We want to add just enough water to make rolling this out a possibility. We have mixed our butter and water in. Then, we let our dough rest in the freezer for a bit and now we are ready to roll out the sucker. This is the moment of truth and one of the hardest parts of making a pie crust. So many times, I found myself so frustrated at the dough. I threw away too much dough. In retrospect, some of the dough I threw was fine (SOME), but the problem was me. I didn’t go into it in the right place. I was in a place where I wanted to dough to happen now. My rolling pin was being used to bully that dough to do what I wanted, no matter what the dough wanted. It was ending in disaster until I finally got it. The time I finally ‘got it’, I went into it in a place of zen. I told myself that I just needed to be in the moment and listen to what the crust was trying to tell me. When things didn’t go right, I would just stop… adjust… and move on. If I needed to start over, then so be it. The thing that I learned was that I was walking this tightrope. On one side of the tightrope was my force or perceived control over the dough. The other side was the crust doing whatever it wanted to do. My job, as the tightrope walker, was to listen to the dough and work with what the dough was telling me. At the same time, I had to use my tools (rolling pin, flour, ice cold water) to get the dough to where I wanted. I would roll the dough and it started to crack. OK. So, if I continued to roll the dough, the crack would just get bigger. The dough is telling me that it wants to do bad things. How do I balance that? Can I use my hand and/or rolling pin to fold the two cracked edges together? At these moments I stopped and dealt with what the dough was telling me. YES, I just wanted to make a damn pie. That wasn’t going to happen, however, if I didn’t take time and effort to deal with the crack. This is the balance between listening to the dough and being aggressive with it. The one crack happens, and you deal with it. The dough isn’t uniform, but I just deal with it. Each one of these obstacles is one further step along that tightrope. Yes, we want to keep our eyes on getting across the rope, but it is more important to pay attention to this step on our journey across the tightrope. Each step, while you are taking it, is the most important one. If you become unbalanced too far on any individual step, it becomes a disaster. I learned that no two doughs are going to be the same and things are going to happen. Are the things really problems? Not really, but merely obstacles in making this beautiful dough. They are the steps that we need to take to get across that tightrope. 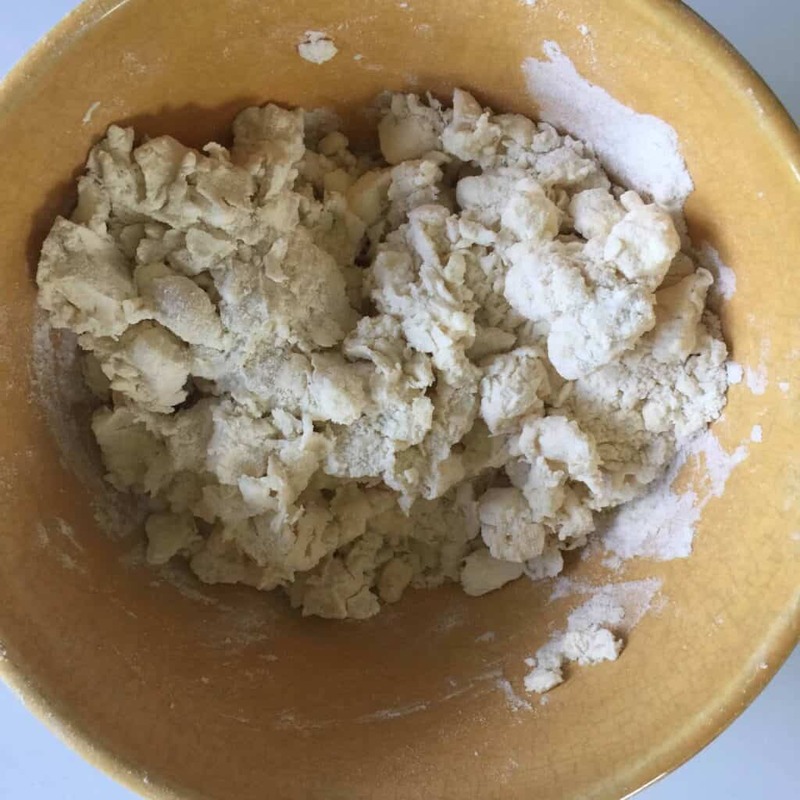 We have successfully navigated the tightrope when we have a pie crust that is completely rolled out, still has large speckles of visible butter, and you can handle it enough to get it into the pie crust tin. Pie crusts can be very frustrating if you let them be. Just find your place of zen, work your pie crust at the moment, and step across that tightrope. This is the superstar of the pie, right? This is the flavor that is going to knock you in the head and, fortunately, this is the easiest part of the pie. Making the pie slices thin is important, as this will ensure a good bake of the filling. Also, selecting a great apple is also important. I believe that Granny Smith and Braeburn are the best widely available apples for apple pie. They both have a crispness that holds up during the baking. Granny Smith apples, however, can be fairly tart. Good thing we add a boatload of sugar, right? HA. I ended up going with Braeburn, but I think either would be fine. Perhaps a combination of both would be a fun thing to try! Why Tin Foil During Baking? You have rolled out your perfect butter pie crust, filled it, and sealed your pie. You have put the slices in the top of your crust so air can escape, right? We are not done yet. Put an egg wash on top of the pie. This will give it a nice golden brown color and I feel like it adds a bit to the texture. Sprinkle a bit of sugar on top of that! Also, add tinfoil around your crust for the first 35 minutes. There are also crust guards available, but I used tinfoil. This will help keep your crust from burning. I remove it the last 5-10 minutes of baking so the color can catch up a little bit. Once your pie is removed from the oven, place it on a rack and let it sit for AT LEAST 2 hours, but more is preferential. Let that perfect American Apple Pie rest and fill your house with the awesome smells of the nummy pie. We added some caramel sauce to our pie, as we probably need more sugar, right? We made a half batch of Pioneer Woman’s Easy Caramel Sauce and it tastes absolutely divine. So, there you have it. The perfect American Apple Pie. There is so much tasty stuff going on in this pie and the butter pie crust is completely worth the effort. If you want to make something special, consider making this awesome pie. Also, if you like what we are doing, please sign up to get updates in email and follow me on Instagram! 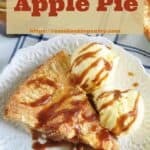 This American Apple Pie has a great crust, an awesome filling, and is the quintessential American dessert. Treat yourself and your family to this Apple Pie Recipe today. Loosely wrap the crust edges with tinfoil to help prevent overbrowing of the crust edges. Sounds yummy. Appreciate the nice walk-through. Now if only I could make a crust as fast as your time lapse. Goals. true story! With all the cooling time (20 minutes for butter, 20 for dough), I really got it down to less than an hour, but really only 15-20 minutes of work. Your pie looks delicious! 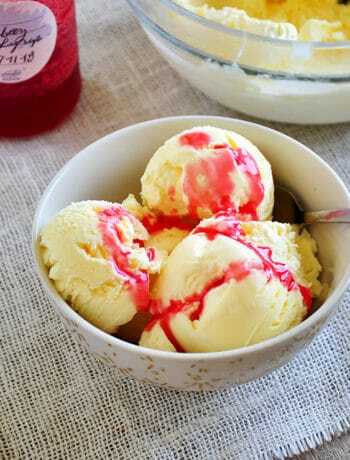 I love the addition of caramel sauce. Best crust tutorial I’ve ever watched! It really is more than a good recipe, technique is everything! I made the Dutch Apple version but got nervous about the whole cup of butter to 3/4 c. flour ratio and used a different streusel recipe. Sharing your recipe on Facebook! Thank you SO MUCH! I really appreciate the complement! And you are SO right on the Streusel topping. I do my best to make the recipes spot on and on my last run I always try to follow my own instructions step by step to catch any mistakes I made. Sometimes, I trip over myself. I missed a brown sugar ingredient in there that was in the picture! looked at my notes and added the ingredient. Thank you.